Discover beautiful single beds from French manufacturers Parisot. Renowned for their fantastic range of quality styles and finishes, Parisot offer real-world solutions for modern families. From contemporary and sleek, to more traditional designs, Parisot have something to suit every interior scheme. Optional extras and integrated storage solutions such as under-bed drawers and over-bed desks add to the appeal and functionality of their products. 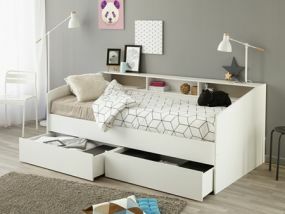 Safety has always been a key design consideration for Parisot beds so you can rest assured that whatever design you choose, your bed will be a safe, stylish and comfortable place to sleep. Our full range of Parisot single beds is presented here. Simply choose your ideal single bed model, then customise the finish and colour, adding any additional storage options to create a bespoke bed which suits your bedroom perfectly. Both affordable and with outstanding design, the Parisot single bed collection is designed to take your room from bedroom to sleeping sanctuary.